I’m pretty sure an alien spacecraft landed next door. No, I didn’t see any flashing lights or silver cigar shaped objects floating in the air. I was actually indoors most of the evening minding my own business. (aka stalking friends on Facebook) It was a rather uneventful night. Popcorn, bouncing baby, watching Teenage Mutant Ninja Turtles…THREE! Three kids were out doing their thang, so it was pretty quiet here at the casa. As I sat listening to the sound, trying to figure out what it might be, I imagined my neighbors being taken away by aliens. Would they beam them up in a conduit of green light? Would they put them in huge ziploc bags and throw them over their scaly shoulders? Would they shrink them and put them in tiny balls like those littlest pet shop toys? What would they want with my neighbors anyway? Are they that much more interesting than my family? I mean, really? We have all kinds of crazy going on at MY house, why not take us? The funny thing is that I was (am) planning to take the kids on a road trip to Roswell next week to check out the alien crap, I mean…..’evidence.’ I thought it would be fun to go see what it’s all about. We will most likely hit Carlsbad as well, since we have to pass it to get there. Who knows? Maybe we will actually learn something during spring break! Is that allowed? The sound from next door stopped when I started writing this. Maybe all the aliens wanted was to be acknowledged by an amazing blogger. done. Or maybe they finished eating my neighbors and left. Or maybe, they decided to lay low and wait for the really interesting people next door to my neighbors to go to sleep so they could watch our dreams. My dreams have been pretty amazing lately so, I would not be surprised. 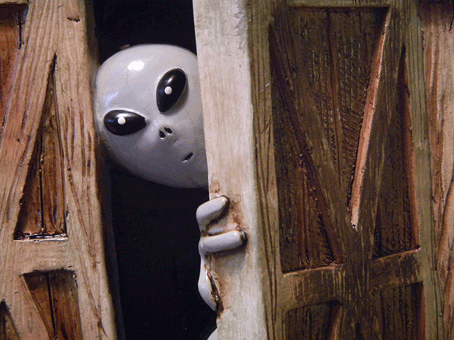 You just never know with aliens….cause I said so. This entry was posted in Beckie and tagged aliens, babies, barf, brains, cigars, crap, dreams, martha stewart, men in black, neighbors. Bookmark the permalink. Beckie, you send me into spasms of hilarity! I love this post. And, frankly, any alien that didn’t want your family over any in the neighborhood isn’t worth his weight in…uh…alien goo!